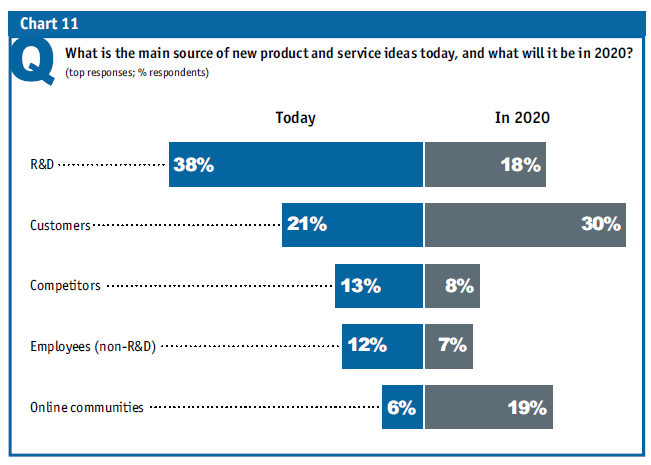 According to a new report by the Economist Intelligence Unit, titled The next decade of Technology in Business, business leaders believe their companies customers will replace R&D as the main source of new product and service ideas by 2020. I’m surprised the percentage isn’t higher. The pattern is evident, organizations believe social media technologies open up communication channels with their customers. This helps businesses develop a more strategic relationship with their customers by co-creating products and services. What this chart also shows is how ideas coming from employees are believed to be of lower value. I would like to see ideas coming from employees given the same or as much importance as coming from customers and online communities. To innovate today, we have to include customers, employees and partners. We can’t exclude one from the others. This is critical because today, money follows ideas. And ideas are not found in work cultures with low expectations. They are found in social organizations that leverage the knowledge of their employees, customers and partners. What is the critical point for me, is that we have spent so much time talking about the voice of the customer that we forgot about the voice of the employee. What do you think, have employees lost their voice in favor of the customer? Tagged co creation, economist intelligence unit, Innovation, R&D, social business, social media.